All photos by Huw Jones. As per normal drills for a Draenen trip, I turned up to Pwll Du at 0900 and funnily enough, the weather had changed from a lovely dry early winter’s day in the Usk valley floor, to a howling gale with threats of rain. I decided to lead the way by pointing my car into the wind for the inevitable chilly change in/out of kit. I was soon joined by Richard who has the luxury of a van to change and brew up in closely followed by Tom ‘McCrae’ in his Landy. Huw wasn’t far behind and we all convened before getting kitted up. 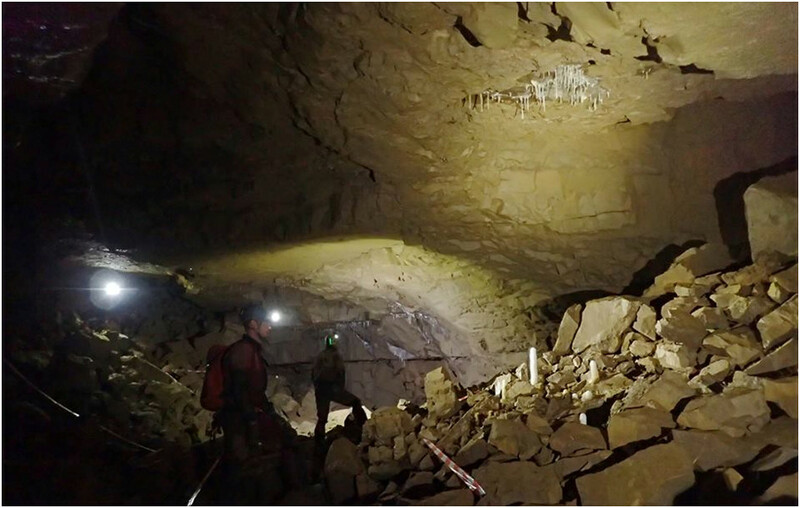 Now it’s worth noting that the last time Huw and Richard had caved together was some 25 years previous and it just goes to show how small a fraternity the South Welsh caving is. Kitted up within minutes we stomped off to the entrance like we were paid models for ‘Aventure Verticale’ but only better! Gate opened, local’s trees freshly watered and we were in. Forget my previous reports on Draenen, I actually love this entrance series! It’s fun…on the way in anyway. We were soon at the climb down, but before we continued, Tom did some checks on the fixed aids as part of his checks for the Pwll Du Cave Management Committee. Log book signed, we stomped off from Cairn Junction towards Wonderbra Bypass and further onward towards Tea Junction where we stopped off for a quick water break and collect some rubbish and old kit we had spotted on previous trips. We piled it all up ready to take out on our exit in a few hours. Conversation was flowing now as usual with mostly expletives from myself when finding those unwanted slippy edges of boulders for which Draenen has many! We boulder hopped our way through White Arch Passage and Lamb & Fox until we reached the Indiana Highway where the expletives swapped from me to Richard as he discovered his new wellies weren’t very grippy on muddy traverses! We ‘’popped’’ out into Megadrive, I don’t know why but I really like this part of the cave and its always worth stopping to look up, around and behind to see what/how the water has done to create this cave. Heading off into The Nunnery and further onward turning right into Perseverance 2 which is a hands/knees crawl which every time I do it always ends up with my dragging bag getting stuck on something. Forgot to mention, both The Nunnery and Perseverance are nicely decorated and well worth a very short stop to admire some of the formations. Perseverance gets larger and we achieved walking status again only for it to suddenly stop at an 8m laddered pitch….and I mean it literally comes out of nowhere. You have two choices at the pitch, a rigid ladder which is getting old and has a few steps missing (so who knows when the others will fall off) or more conventional/safer caving ladder albeit more awkward. Being the brave souls we are we opted for the rigid ladder….purely so the fixed aids officer could do his ‘’checks’’…..obviously. The pitch drops down into Cardiff Arms Park, an impressive chamber and the way on is pretty much back underneath the pitch and leads into Player’s Tunnel where we encountered some good formations and we stopped for drinks/pictures. Soon after, some more boulder hopping the awe inspiring St. David’s Hall was reached and lunch was called whilst sitting in the marvel of this enormous chamber. It has to be seen to be believed! After lunch the fun starts, being The Round Trip Connection. Now this is where we start to cut across with an end goal of getting into Beyond A Choke Stream to head back out of the cave. To start, we headed into Squirrel Rifts, a notorious part of the cave for navigating with its many choices of different rifts to take and all very much polished by wrong steps before! Thankfully every time I’ve done the Round Trip I’ve been with someone who knows (relatively) the way through and Huw was no exception so no hiccups were encountered. Carrying on through Wooden Spoon we squeezed through quite an awkward sideways rift just before Haggis Basher and I heard swear words a youngest nephew should not hear from his uncle! But I didn’t blame him whatsoever. Some stunning stals and formations were found in Haggis Basher where we left the bags and headed off to the chokes at the end for a nosey. Tom sadly found a newer formation in the form of a pile of human poo…yeah nice one whoever did that. We had a poke around in the chokes then we went back to collect the bags to head off towards Far Agent Blorenge where pleasant stream walking was encountered and the conversation was back in full flow. Best way I can describe Agent Blorenge is sporting…lots of awkward traverses where Tom was heard to be having fun with his bag getting stuck at every opportunity, a couple of unofficial fixed aid climbs down and also the fun Sewer which is a short duck but with today’s water levels was just a soaking. Towards the end of Agent Blorenge the cascades were met with some interesting climbs down. The Beyond A Choke stream way is reached at the end, we took a right, ending the connection, Round Trip and beginning the slog out of the cave. I love this stream way, it changes so much in its length and even has a few boulder chokes chucked in just for good measure and most importantly my favourite formation so far in this cave (I still have much more of this cave to visit) in the form of pure white stalagmite up on higher level of the stream way. It’s very photogenic! We passed the entrance to Gilwern Passage and checking our watches decided it would have to wait for another day and collected the rubbish from Tea Junction. 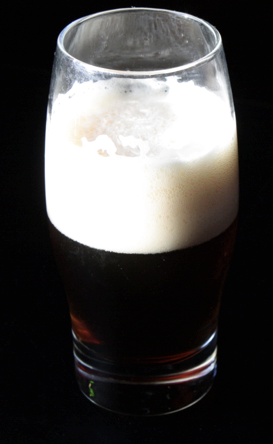 We exited the cave to more darkness but nice, still weather and the conversation soon changed to what was for tea and what beers were in the fridge. Cars reached, kit stripped and final few words of the day were shared! I met up with Huw and Huw at the Chelsea cave club cottage, Whitewalls, overlooking Crickhowell and the Usk. It was a busy weekend at the cottage and I was met at the door by the lovely smell of fried breakfast cooked by the full house of Imperial College Cave Club members. The wind was up that weekend and the power was out as a result, so gone were my hopes for a warm shower and a cosy changing room to change in before and after the trip. 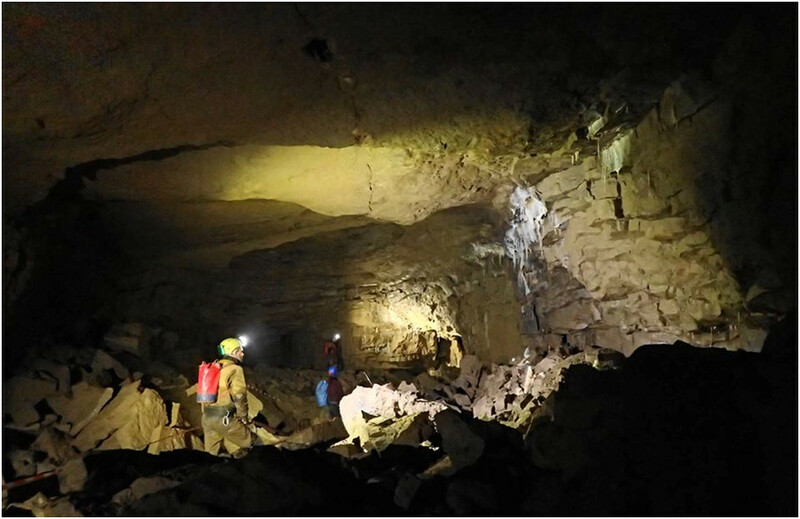 The planned trip was to go through Price’s Dig and explore Busman’s Holiday, which is a tiny part of the Darren Cilau cave system. This wasn’t the trip that I had originally planned. The first plan was to go into OFD 1, but it had rained too much so the streamway in OFD 1 was out, then the plan was to go into Ogof Draenen, but that changed to Price’s. A year before I did a trip from the entrance to Darren through the cave emerging out of Price’s. 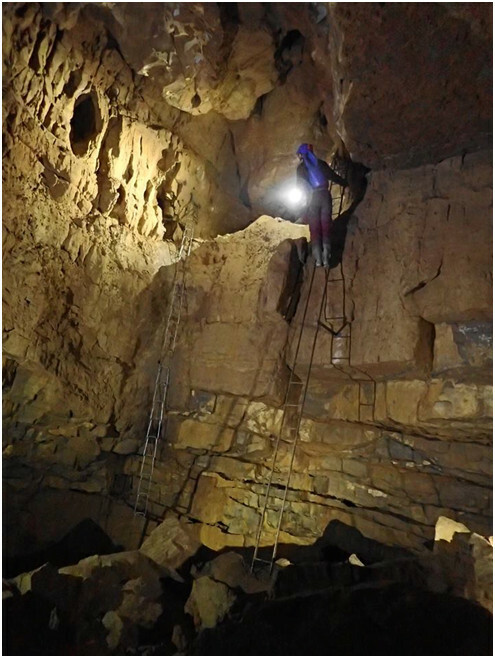 It was one of the hardest cave trips I have ever done and after emerging from the muddy crawl in Price’s and I vowed to never again go in there……. We got geared up and offered to help carry some digging gear in for Tony Donovan who was attempting to push through a boulder choke in Price’s to hopefully find a way through to Craig A Ffynnon. We made our way up the hill, through the locked gate and started our crawl through mud, scaffolding and a few very tight spaces. I have to say at this point that none of it was particularly difficult but being tall and long legged I find crawls tiring. I led the way down through a scaffolded shaft down to a sump! The way on used to be a sump but Tony, who we were carrying the gear for, managed to encourage the rock to move out of his way and produced an easy bypass. Shortly after this bypass you get to a long phreatic tube, which is impressive to see and cosy to slip through. We emerged in to the large chambers that are synonymous with Llangatock cave systems. I am always impressed by the size of these chambers and large rectangular passages. My light, a Petzl Duo struggles to reach the ceiling in most places. We turned left and headed down towards the newest extensions to the cave. We waited in one of the boulder chokes for Tony to join us and guide us to where he was attempting to open more passage. Tony is definitely at home underground and impressively can move his sizable frame quickly through difficult cave passages with large amounts of gear in tow. Rock seems to move out of his way and with good reason. We carried on through a well decorated cavern. The “pretties” which are rare under Llangatock are really special, they are few and far between this high up on the mountain but the ones there are special. After a short break there we carried on to the newest extension to the cave where we dropped our gear, leaving Tony and his helper to move to the dig. We doubled back explored further down the gigantic passages of Busman’s which lead back into the main system of Darren. After a bit we made our way back out through Price’s. Soaked, muddy and exhausted we emerged from the cave and went back to Whitewalls, where we got changed in the dark changing room. It was a good trip. Good experience, good company and some good stories. The trip did highlight that I need a better torch! An evening trip to assess a possible dig in Gelynnen. It was decided that it looked hopeless so Huw and Lee carried on for a short trip into a very wet Caple. Early on a Sunday morning at the beginning of December I drove from Abergavenny about 50 minutes through the beautiful countryside around Brecon en route to Penwyllt in the Swansea Valley. Penwyllt is the headquarters of the South Wales Caving Club who are the gate keepers for the Ogof Ffynnon Ddu cave systems. There I met up with Huw and a new man to the club named Lee. Lee’s other half Carolyn had meant to come but after doing her first BCC trip into Aggy earlier that week she was still a bit stiff and decided to give this trip a miss. We changed into our gear and Huw grabbed the key and signed us out on SWCC’s caving board. Cavers on the whole are very enterprising with their approach to gear, producing bespoke and homemade/altered gear and Lee was no exception. He came to South Wales from the peak district and a climbing background, having done some caving, where he claims that he didn’t have much use for a helmet. The helmet he pulled out of his gear bag was an impressive creation. He had adapted a helmet with black duct tape to hold several head torches. We walked down the hill to the cave entrance, about a 20 minute walk. This was a new way of approaching the cave for Huw, who said that years ago you had to drive down the hill, park and use someone’s drive, but recently the right of access and land had been secured by the club allowing us to walk down from the club. We approached the entrance, descended the ladder and opened the gate to enter OFD 1. The plan was to do the round trip. Huw had printed out the surveys and route descriptions and highlighted our route. He gave me the opportunity to lead the trip and do the route finding. We got our bearings and set off through the lower section which had been set up to be a show cave with concrete floors and railings, now gone. We made our way to the Toast Rack which is a junction, either going straight on through Pluto’s bath or up the fixed step ladder that takes you up over a six foot smooth flowstone step. We went up and came shortly to another junction, where we took a right under some fine curtains and headed to the Step, which was a nice series of steps down into the main Stream Way. The Stream Way was brilliant, a long winding passage with rushing water carving great shapes and scallops into the rock. Crossing the pots is the main hazard at this water level and is fun because you have to balance on a rolling scaffolding bar which is attached on the upstream end. None of us swam, but we did fill our wellies! We made our way along to Lowe’s Chain which is a smooth 4 meter high wall with two fixed ropes hanging down it. We passed this and went on up the stream to a waterfall and the end of the passage, where I climbed up over a natural stone bridge to have a look at the entrance to the Waterfall series. It was a precarious climb and I wouldn’t recommend it to anyone with a fear of heights or a priority on self-preservation. I carefully climbed down and we made our way back to Lowe’s Chain where we climbed out of the Stream way. The climb wasn’t too tough, but this could prove to be the most difficult part of the trip for some cavers. This took us up into the Rawl Series, a dry blocky series of passages, chambers, and chokes where Lee discovered the value of wearing a helmet. The cave here is similar in character to OFD 2 further up the hill. The route took us up and back around on ourselves until we arrived at Pi Chamber where we went left, and I found the way on behind a boulder which dropped us steeply down a small phreatic tube (a long way down surprisingly) to the beginning of the bolted traverse 50 feet above the Stream Way. If you don’t like traverses, cow’s tails are advised to attach yourself to the cable, but it is a wide and flat ledge that can be done without them. The start is the scariest bit because you have to slither over a polished bolder and carefully get your foot on the ledge beside the drop! I managed without attaching myself to the cable, tucking my elbow over the cable and slithered along the wall when the ledge narrowed!! Exciting!!! After the traverse the passage meanders until you pop your head out of a dig and then crawl back to a recognizable junction where we saw the hanging curtains earlier. We had finished the round trip and done if fairly quickly so we headed back down past the curtains and scrambled up a smooth flowstone climb on the left and made our way to along Column Passage to The Column, which is well worth the visit. We then went back down to the stream to a fork which lead us back up to the Toast Rack, this time crossing Pluto’s Bath. I successfully crossed it without getting soaked due to my long legs. Lee got a bit wet! We made our way out and back up the hill, to the showers and changing facilities at Penwyllt. 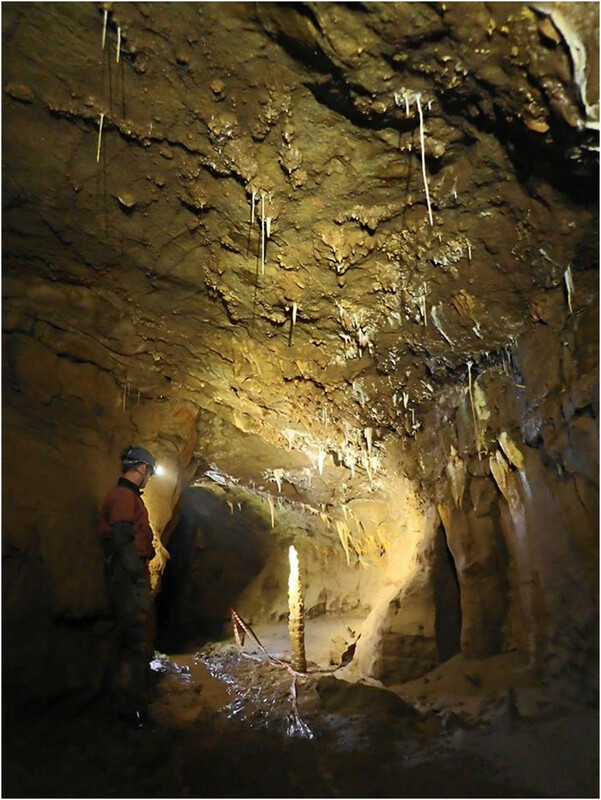 It was a great trip and you can see why it’s a classic caving must do for any aspiring caver. It takes less 4 hours, its good practice for navigating, it has every variety of cave challenges, none of which are too extreme or unpleasant and it’s stunning. It’s a lot of fun and having a warm shower and a roaring fire to follow it up makes a perfect day.